SPIE is very generous to its student chapters, which includes financial support. Chapter members thus receive much more than what can be covered by their membership fees alone. – SPIE Activity Grant: Funding is provided proportional to the number of chapter members. – Membership dues: Most, if not all, of the dues from student members are returned back to our local chapter. – SPIE Visiting Lecturer: Travel funds for one speaker chosen by the chapter per year. 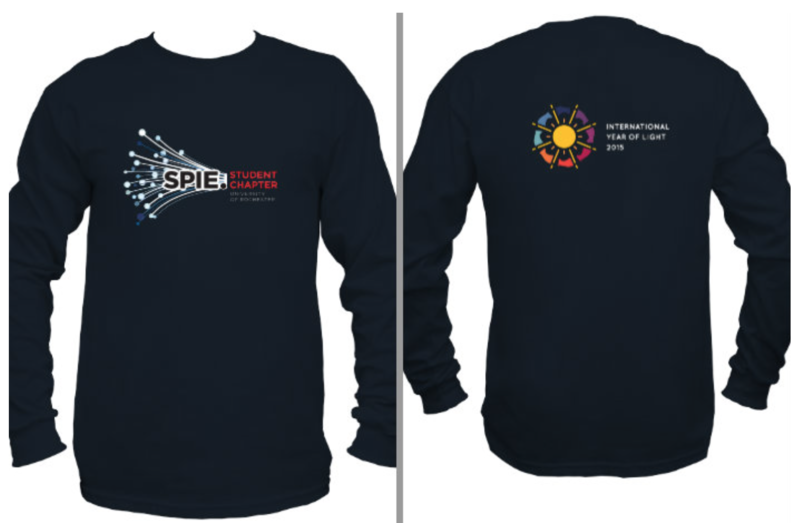 – SPIE Officer Travel Grant: Grant to support officers AND chapter members for one SPIE conference per year. – SPIE Student Scholarships: A core value of SPIE is to use much of the revenue to support students. Individual scholarships range from $2,000 to $11,000 and many of our student members receive such scholarships (http://spie.org/x84950.xml). Student author travel grants are also available (http://spie.org/x27602.xml). – Local Companies: The local Rochester optics community has been generous to us as well. Local companies usually sponsor a portion of our company tours. FREE LONG SLEEVE T-SHIRT FOR MEMBERS!! Become a member of SPIE and join our Student Chapter! On top of all the benefits you will receive this beautiful long sleeve t-shirt.